THIS IS NOT AN EXPERT ADVISOR THAT HAS 100% TRADING ACTIVITY. 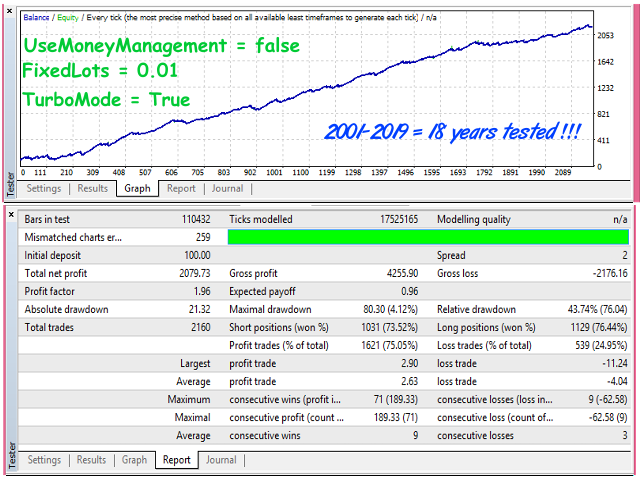 IT ONLY OPEN TRADE WITH WELL DEFINED AND ROBUSTNESS TESTED ALGORITHM. While observing the performance of the EA, its update will be carried out from time to time. Thus is a fully automated expert advisor that scalp when there is relatively large price movement in market and the price breaks out defined extreme. Bollinger Band and William Percentage Range Indicator are used as filter the trading signals. Stop loss and profit target are always set for every trade. Closing of unfavourable trades is handled by MACD indicator. Note that, the default setting is for EURUSD pair. Pair - EURUSD, GBPUSD, AUDUSD, EURUSD, XAUUSD. $100 minimum deposit for a pair, on 4 digits quote account. $1000 minimum deposit for a pair, on 5 digits quote account. RS_MaximumTolerantSpread - maximum value of spread for opening any trade. NOTE THAT THE EA DOES NOT AUTO DETECT IT FOR 5 DIGIT QOUTE. YOU SET YOUR MAXIMUM VALUE. ClosePositionOnFriday - if set true all the open positions will be closed on Friday night. TurboMode - if set true, the expert advisor uses additional inbult strategies to open positions. Maximum of six (6) trades can be opened. It is available only for EURUSD. SLa_Buy - Stop loss for every buy trade. The EA auto detect the value for 5 digit quote. TPa_Buy - Profit target for every buy trade. The EA auto detect the value for 5 digit quote. SLa_Sell - Stop loss for every Sell trade. The EA auto detect the value for 5 digit quote. TPa_Sell - Profit target for every Sell trade. The EA auto detect the value for 5 digit quote.